Cornwall, ON – Christopher Motard, 39, of Cornwall was arrested on February 11th, 2019 on the strength of a warrant. It is alleged on June 13th, 2018, the man used a fraudulent prescription to obtain a quantity of hydromorphone and a warrant was issued for his arrest. On February 11th, 2019, the man was located by police. He was taken into custody on the strength of the warrant and released to appear in court on February 26th, 2019. Cornwall, ON – Tyanna Tessier, 23, of Long Sault was arrested on February 11th, 2019 and charged with theft under $5000 and breach of probation for failing to keep the peace. It is alleged the woman attended a Thirteenth Street business and removed merchandise, making no attempt to pay for the item as she left the store. Police were contacted and an investigation ensued. On February 11th, 2019, the woman attended police headquarters to deal with the matter. She was taken into custody, charged accordingly, and released to appear in court on February 26th, 2019. Cornwall, ON – Jeffrey Nevins, 34, of Cornwall was arrested on February 11th, 2019 and charged with breach of recognizance for failing to sign in. It is alleged the man failed to sign in to police on January 28th, 2019 and an investigation ensued. On February 11th, 2019, the man was taken into custody, charged accordingly and held for a bail hearing. 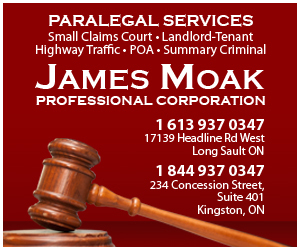 Cornwall, ON – Paul Moncrieff, 18, and a 16-year-old youth, both of Cornwall, were arrested on February 11th, 2019 and charged with possession of property obtained by crime. It is alleged the man and the youth were found to be in possession of a quantity of stolen items that did not belong to them and police were contacted to investigate. On February 11th, 2019, both were taken into custody, charged accordingly a released to appear in court at a later date. The name of the youth was not released as per provision of the Youth Criminal Justice Act. There were 65 calls for service in the City of Cornwall in the last 24 hours (8 am previous day to 8 am this morning).